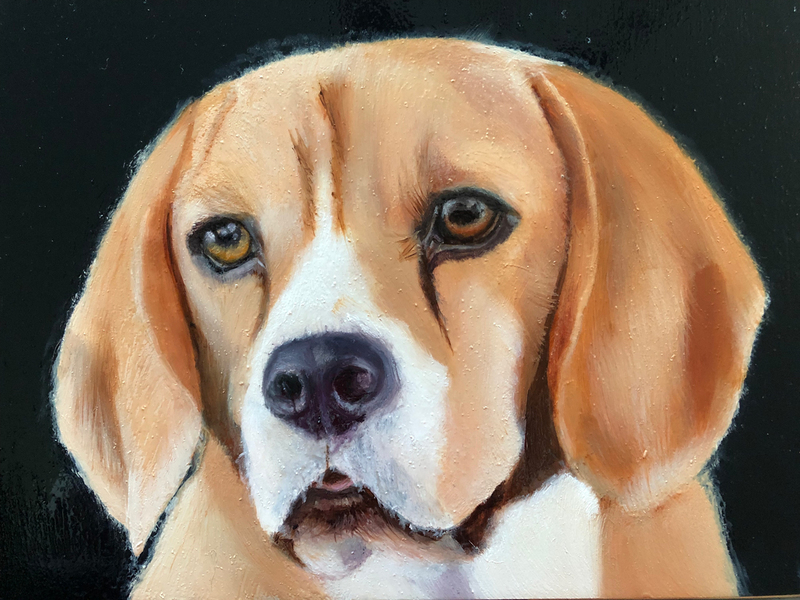 After seeing a customer review by Margriet Pronk explaining step by step how to start painting with Cobra Oil paints, we knew she’d be a great person to expand her review into a list of tips on how to use watermixable oils. 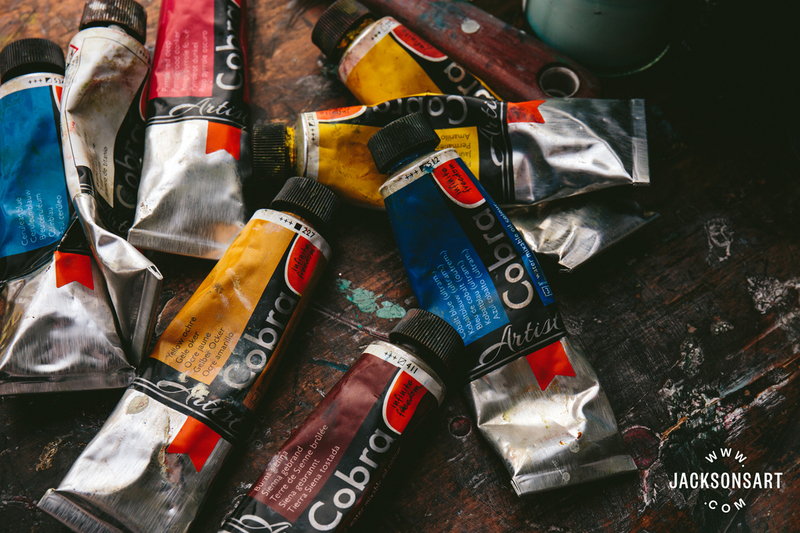 She said that she likes Cobra oil paints ‘because of the beautiful intense colours and the way it paints’ and because ‘after 6 months you can varnish it. 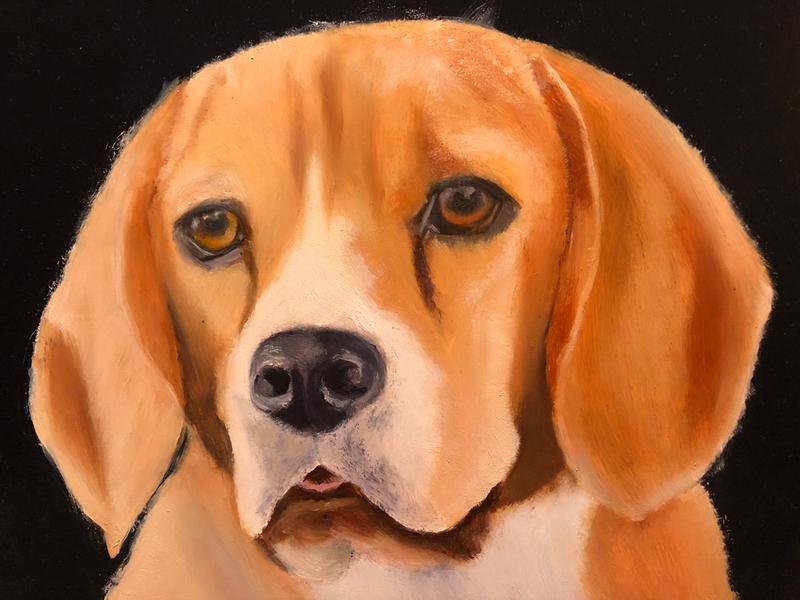 I love the matt version, which gives a brilliant effect.’ We also awarded her a £25 Jackson’s Gift Voucher for writing the most informative and useful review of the month. She’s been painting since 2016, but before that thought she could not paint or draw. In the past, she was creative by working with programming, websites, stained-glass and bead making. A friend of mine started to give art lessons and I told her: “ Whenever you start teaching, I will be your first student!” So that’s why, when she finally started giving art classes, I went to them! She’s a great art teacher and nowadays she teaches several classes with lots of students. If you are doubting whether to start something, just start! You can always stop! I tried colour pencils, pastels and then start painting with acrylic because the other students used it. I liked painting but found that every time I tried to blend my paint I got frustrated. I am a slow painter, so acrylic dries too quickly for me! And yes, I have tried slow drying mediums/paint for acrylic, but as I told, I am even to slow for that! So my friend/teacher advised me to start painting with oil paint. I read about normal oil paint and I was shocked by the idea of using “dangerous” liquids, like turpentine. I just did not want to! I know that there are a lot of liquids that don’t smell, but I was always asking myself if that also meant they would not be dangerous? If yóu prefer to work with normal oil paint and turpentine, be my guest, but I don’t. So I bought some Cobra Oil paints (it was the brand sold by the local store). There are two kinds of Cobra; “Student” and “Artist”. Because the “Student” was cheaper, I started with that, but when I knew that this was the medium I wanted to work with forever, I bought all the colours of the “Cobra Artist”. Ridiculous of course, but for me it is an addiction, like it for a collector. Every time I found an excuse to buy new colours, however, of course, you can mix most colours with just a few tubes. I was surprised by how relaxing working with (water mixable) oil paint is, how much less paint you use, how smooth the paint is, how beautiful the colours are, and that the lightfastness is very high. Royal Talens puts a sign on the tubes, which tells how many years they can guarantee each colours lightfastness for. This is very important for when you paint and perhaps sell that painting, as you don’t want the colours to fade away. There are more brands with water mixable oils, but I love Cobra best, because of the points mentioned earlier. I noticed not every brand has a lightfastness guarantee, so pay attention to that when you buy water-mixable oils. 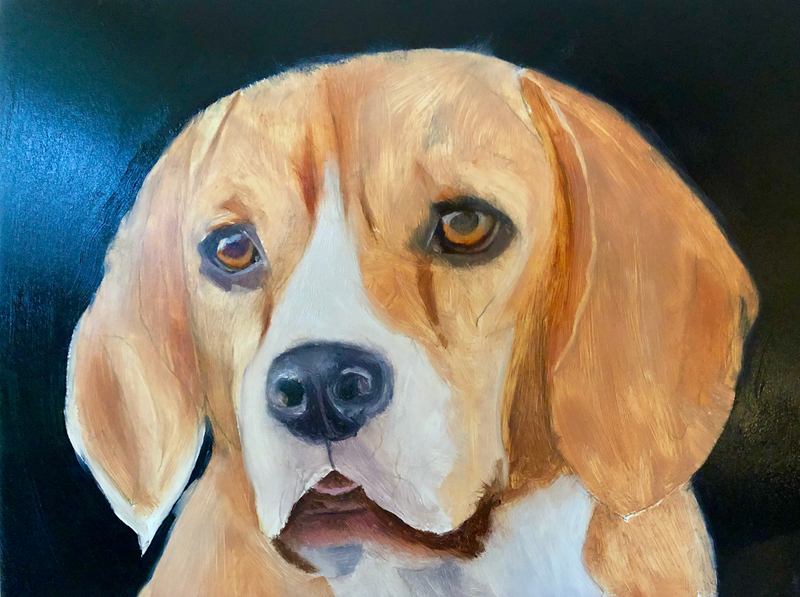 I have enclosed some pictures from when I was painting our beagle, Luna. (BTW: Luna is a famous beagle, she was an actress for a commercial of the KLM and “Sherlock”. Just google these last words on YouTube and you will see her). It is painted on a panel with a measurement of 18 x 24 cm (7 x 9 inch). I have transferred the picture on a panel with a projector and an aqua pencil. I still think I that cannot draw. Since I know that even the great Dutch painters, such as Vermeer used camera obscuras, I don’t feel guilty anymore. Why should I spend a lot of time drawing and correcting when I can do it so much easier and quicker? You see that I start with the background first. The background of a painting is what I find the most difficult about painting (which colour? where should the light be? where should the shadows be? etc.) I am still learning about that! Perhaps a nice item for Jackson’s to write about. First layer blocked in with Cobra thinned down with water. I then blocked in the first layer with Cobra, thinned with water. It took about a week to dry. Next layer with pure Cobra paint. The last layer building up details while adding more cobra medium (thinned a little with water) to make the paint fatter. Last layer (for me) is all about the details, I put a little Cobra medium and thin the medium with water. Every subsequent layer, I use more medium and less water with the paint. I would like a medium which is not glossy and shining. Currently, the medium is glossy, so where you use it you get a distinctive shine on the paint. That’s why I can never wait to use the varnish (you have to wait until at least 6 months after you have finished the painting)! 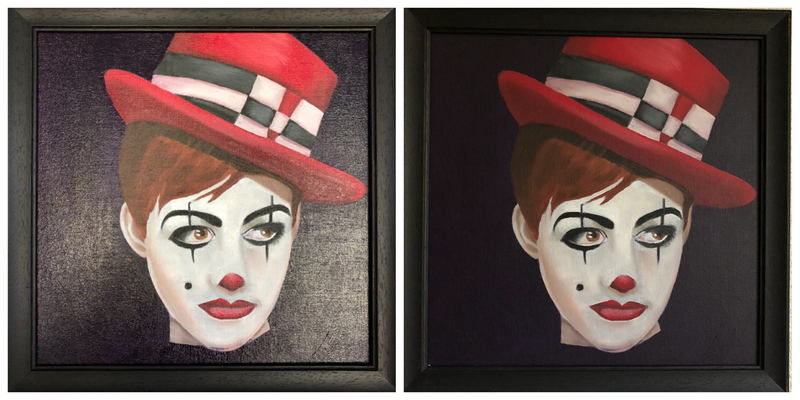 Then everything becomes matt (of course if you use a matt varnish) If you see the photo below of the Clown, you can see the difference before and after you’ve used a matt varnish. I’d also like a varnish that is in a bottle (currently they have only sprays, and these sometimes create drips on my paintings). You can buy colour charts, however, I made one myself. It was a lot of work, but it helps me when I am in search of a certain colour. I miss colours that are very common in the world, like Alizarin Crimson, Dioxine Purple, Viridian and I love to look at tutorials on YouTube (thank you for making them), I find these colours that are often used. 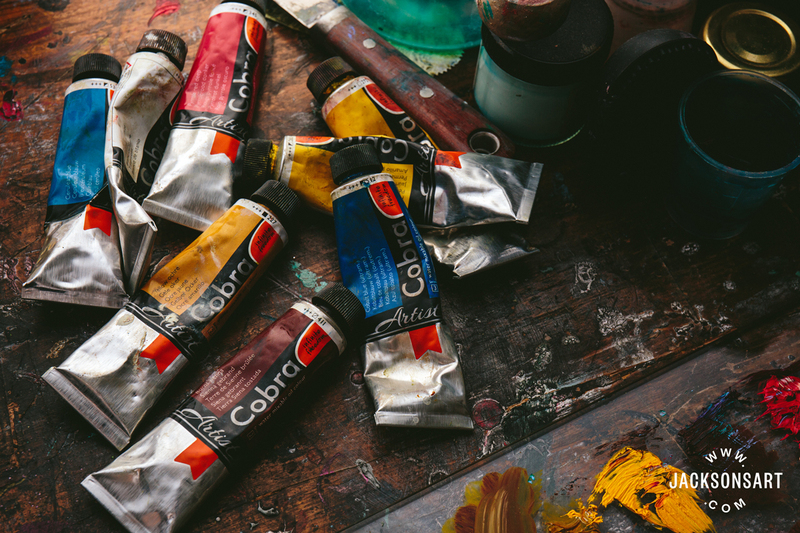 You can view all of our Cobra Watermixable Oil Paints and mediums here.